We have our first finalist for the 2010 Character Cup, although I can't tell you who it is as I'm writing this before the voting has been decided. Today we're looking at our second of three matchups in this round, and we're pitting together a defending champion with a brand new racer. Who will you vote for? Lewis beat Liuzzi in the first round, with double the votes of the Italian. 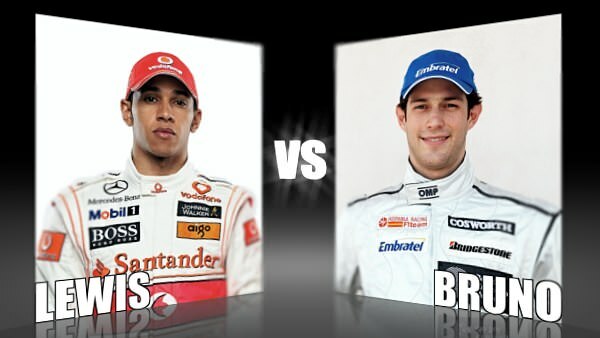 In the second round, he had closer competition in the form of Schumacher, but Lewis was victorious against him as well. Now he's facing up to the Brazilian, and it's interesting to see him take on a relative of the racing driver that he idolises so very much. Senna's first round was a contentious one, with Bruno winning over Jaime Alguersuari after a recount of the votes. In the second round, he was up against fellow Brazilian Felipe Massa and it was an incredibly close contest with just one point between them as the polls were shut. Now he takes on Lewis, someone he normally only sees passing him with a blue flag nearby. Can he show Lewis the blue flag this time?